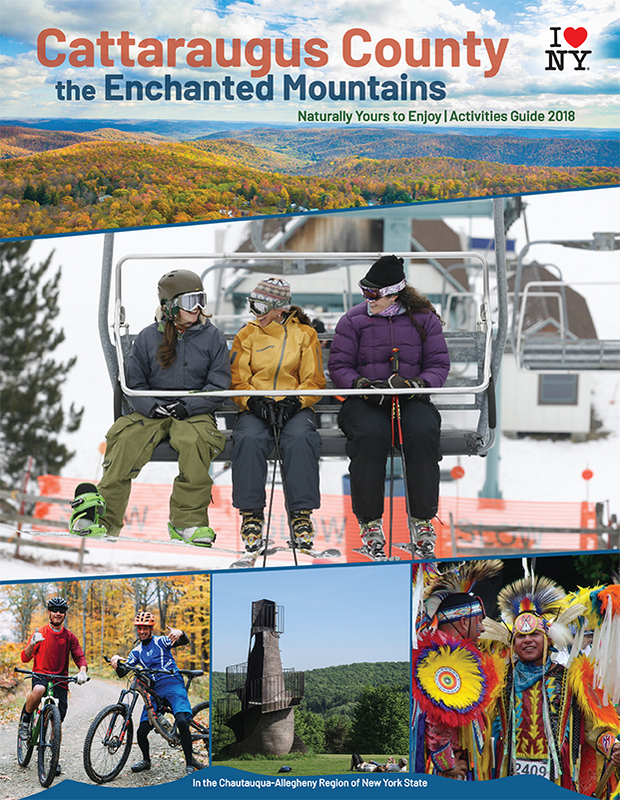 Our Tourism office promotes the activities, attractions, eateries, lodgings, points of interest (POIs) and other tourism-related assets of Cattaraugus County, the Enchanted Mountains of Western New York. Our services are free to visitors and tourism-related organizations. Why promote Cattaraugus County as the Enchanted Mountains? The name originated in this region of New York many decades ago (possibly by Yum Yum Anderson). If you grew up in the country here, then you'll know of the beautiful views that we may take for granted at times. We know that we don't have the mountains of the Adirondacks or the Rocky Mountains, but we have rolling foot hills of the Appalachian Mountains. We love it when people use the name "Enchanted Mountains". People say we're in the Enchanted Mountains. For your use online, here are some logos and badges for the EM. See Referencing the Enchanted Mountains. We are the Tourism Promotion Agency(TPA) or Destination Marketing Organization (DMO) for Cattaraugus County. We assist businesses and organizations with promoting their Cattaraugus County destinations and events. We do this through our website EnchantedMountains.com, social media networks, assist you with press releases and may in print or digital advertising. Another way we do this is with brochure racks and digital display systems (slide show kiosks) around the county that show activities and upcoming events to entice visitors to attend. If you didn't find your business, organization or other point of interest then please fill out the submit a location form. We'll then contact you in regards to your request. We distribute guides and brochures throughout Cattaraugus County and about 300 miles beyond. Do you have Friends and Family coming in to visit you in Cattaraugus County? We produce the Official Cattaraugus County Activities Guide. The Activities Guide is NOT filled with ads. We match most ads in the section of the Activities Guide in which they'll be most effective for you and helpful to the visitor. View the current Enchanted Mountains Activities Guide on EnchantedMountains.com. Would you like to help promote what there is to do in the Enchanted Mountains with a free brochure rack or digital display system? If you would like to have a counter display, brochure rack or digital display in your organization then please contact Tourism. Cattaraugus County is part of the Chautauqua-Allegheny Region of New York State. Stop by our office in the County Center, located on the Second Floor of 303 Court Street, Little Valley, NY 14755.